I drafted a pattern using my basic bodice block and added a full circle skirt to it. It is red stretch lace (it would have been better to use non-stretch but I saw this fabric and just had to buy it...). It's underlined with a beige lining fabric. 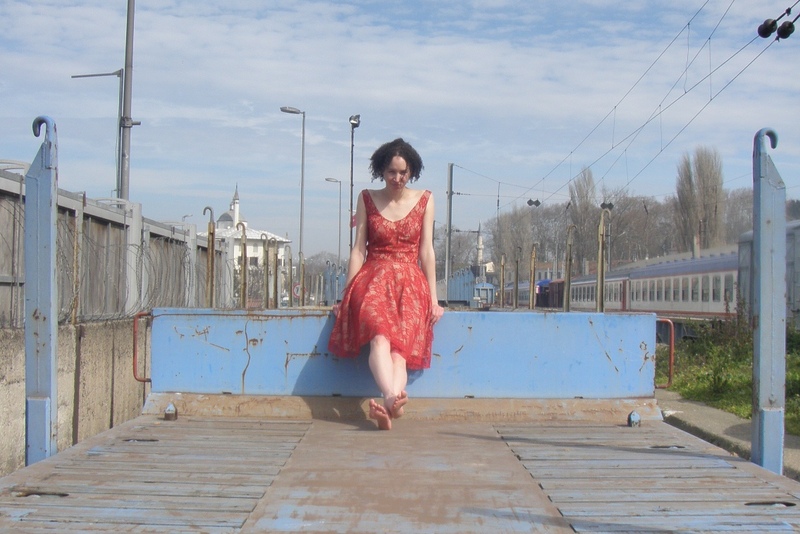 These pictures were taken at a train station in Eminönü in Istanbul. It's a v at the front and curved at the back. That morning we had stopped for coffee at this little "cafe" (tiny plastic chairs and tables set up on the grass by the water) in Karaköy and a group of business men invited us to join them. Such lovely, friendly people in that city! And friendly stray kitties. I really wanted to keep this kitten! Love it! You've done a fabulous job on this one!